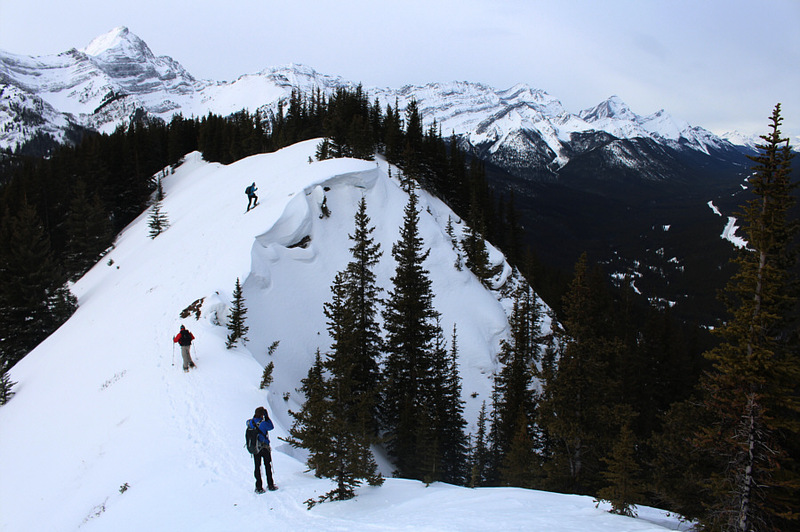 Unofficially-named Gypsum Ridge is a deservedly popular ski or snowshoe objective located on the northwest shore of Lower Kananaskis Lake in Alberta's Peter Lougheed Provincial Park. After an aborted attempt six weeks earlier, I was back on 7 February 2016 to finish the ascent. Joining me on this day were Mitch Lane, Verena Murphy and Andy Pearson. The day got off to an inauspicious start when I got my car stuck in some deep snow at the pullout where we parked. Luckily, I had three able bodies to help me push my car out. 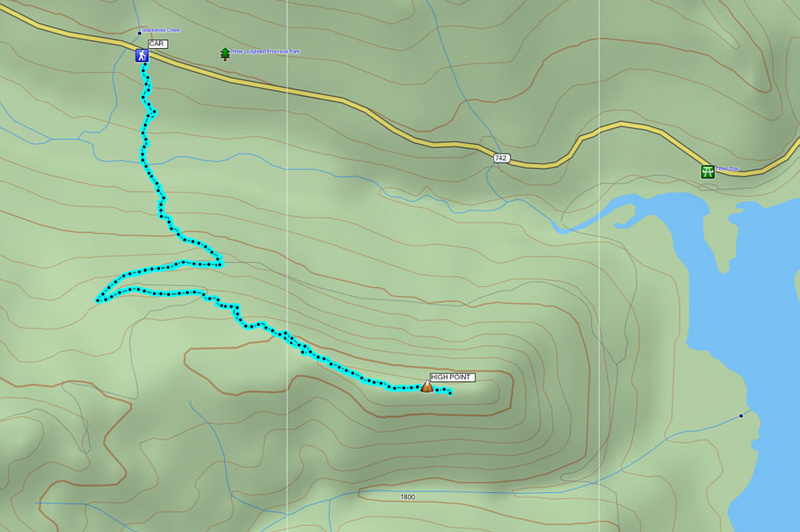 After that brief warm-up, we donned our snowshoes and followed old tracks down to Smith-Dorrien Creek. 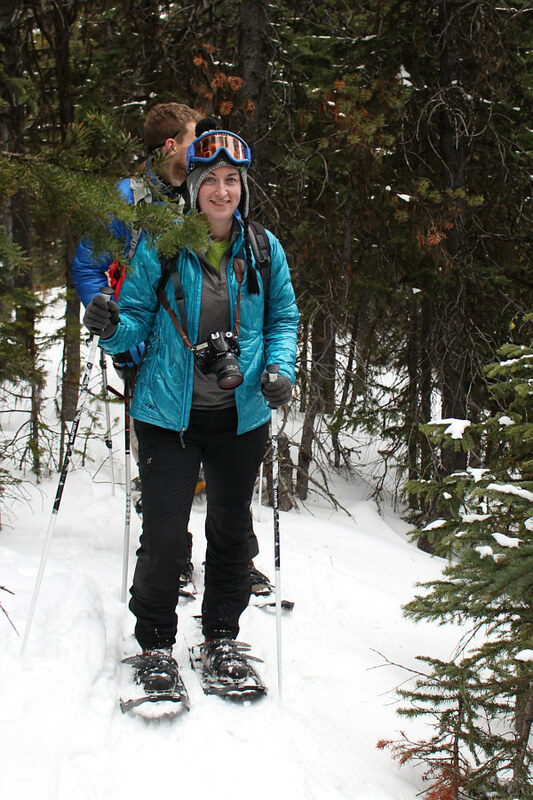 Despite being covered with fresh snow, the old tracks were easy to follow, and we climbed quickly up through the trees on the other side of the creek. 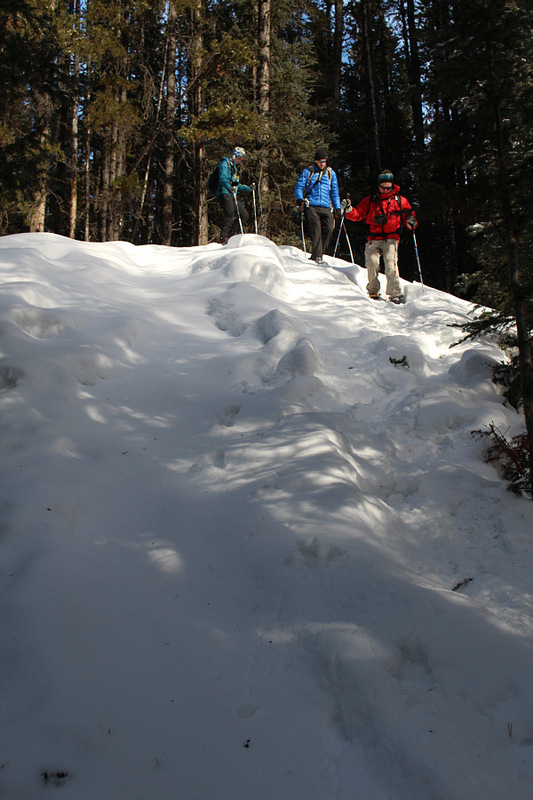 We eventually gained the skiers' tracks along an old road which zig-zags up the north side of Gypsum Ridge. On my previous attempt, the party I was in had eschewed using the road and headed straight up the slope to the ridge crest. 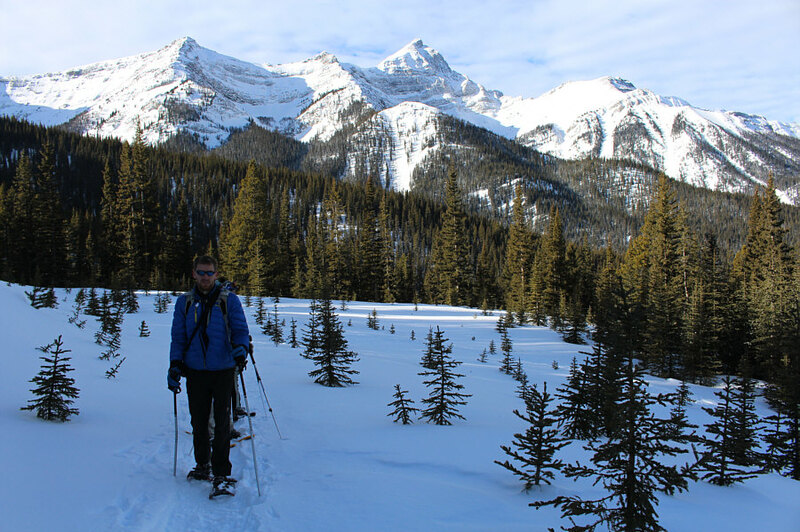 This time around, Mitch, Verena, Andy and I were not too proud to simply follow the ski tracks along the road which allowed for a more gentle ascent at the expense of some extra distance. 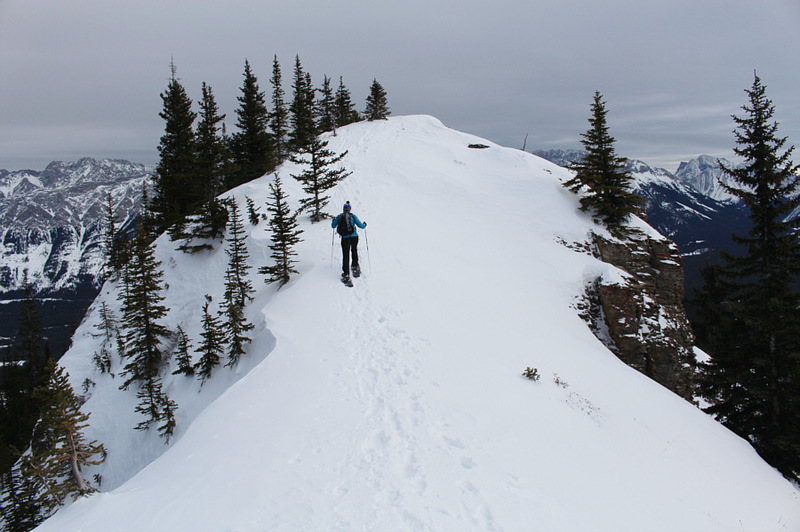 In fact, we followed the ski tracks uninterrupted and without any loss of elevation all the way to the high point of Gypsum Ridge. Because the actual high point is partially covered with trees, we wandered over to a lower knob at the east end which affords a much better panorama. Although clouds rolled in to somewhat spoil the views, the calm conditions and mild temperatures made our 30-minute stay at the top quite pleasant. For our return trip, we retraced our steps exactly without any trouble or hassles. After returning to my car, we drove down the road to Peninsula day use area to enjoy an après-raquettes! Although the day use area was gated, we easily walked to one of the picnic tables near the lakeshore. 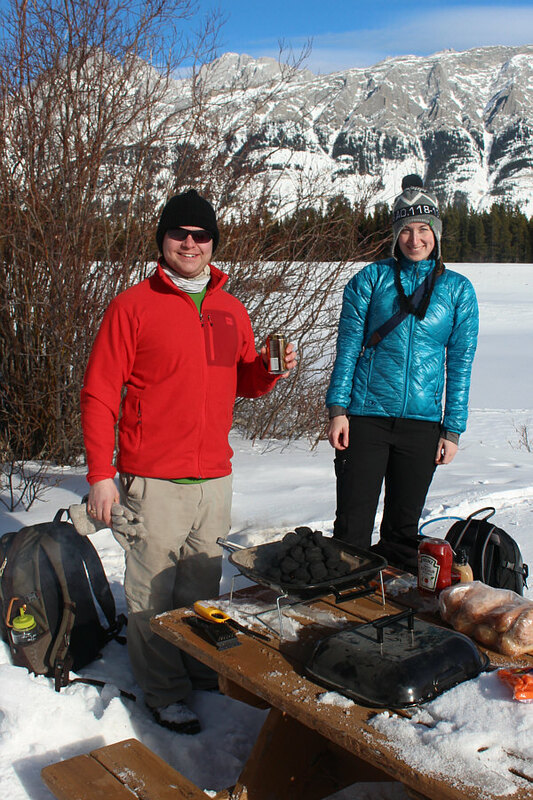 Verena and Andy had brought some snacks and refreshments while Mitch had brought a portable grill and some Spolumbo's sausages. Andy had the great idea to grab the ice scraper from my car to help clear off the snow-covered picnic table. Once we got settled, it turned out to be a wonderful place for a picnic. 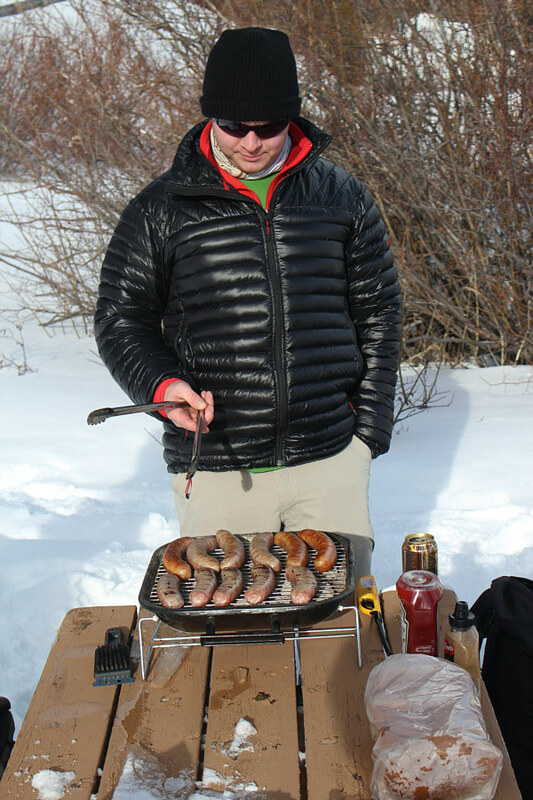 Mitch cooked up the sausages to perfection, and we all had our fill of delicious food and fantastic mountain scenery. This was truly the highlight of the day. Thanks go out to my marvelous companions for their generosity in providing food and refreshments, for their great company, and for helping to get my car unstuck! 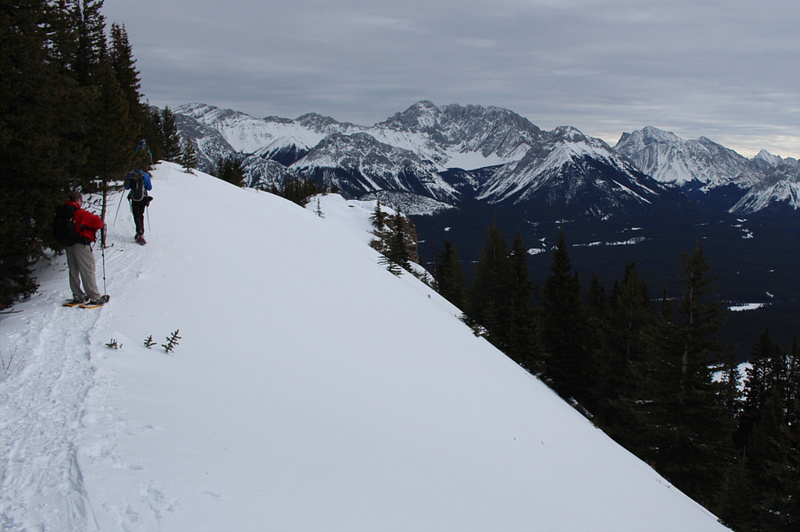 The group descends a steep section just before reaching Smith-Dorrien Creek. 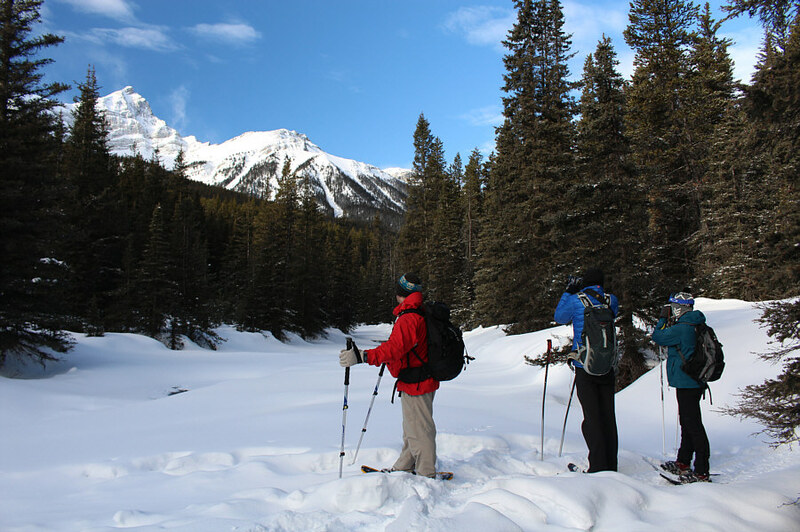 The group stops to admire the view of Mount Warspite before crossing Smith-Dorrien Creek. 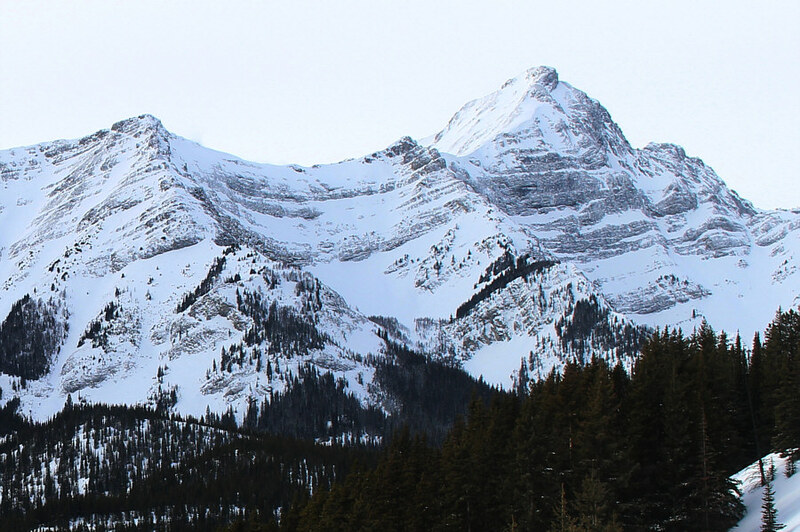 Here is a more comprehensive view of Mount Warspite and its adjoining ridges from near the hairpin turn in the road. Verena seems to be enjoying the outing as Andy and Mitch follow behind her. 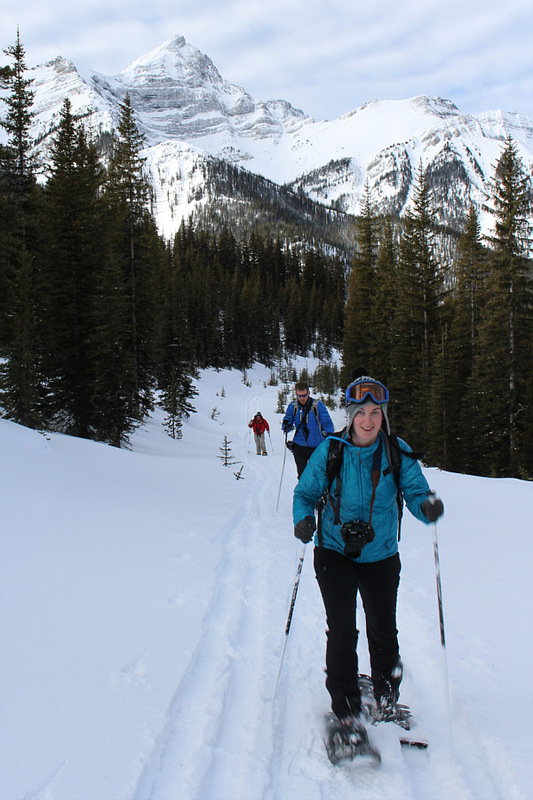 Verena leads the group along the forested crest of Gypsum Ridge. 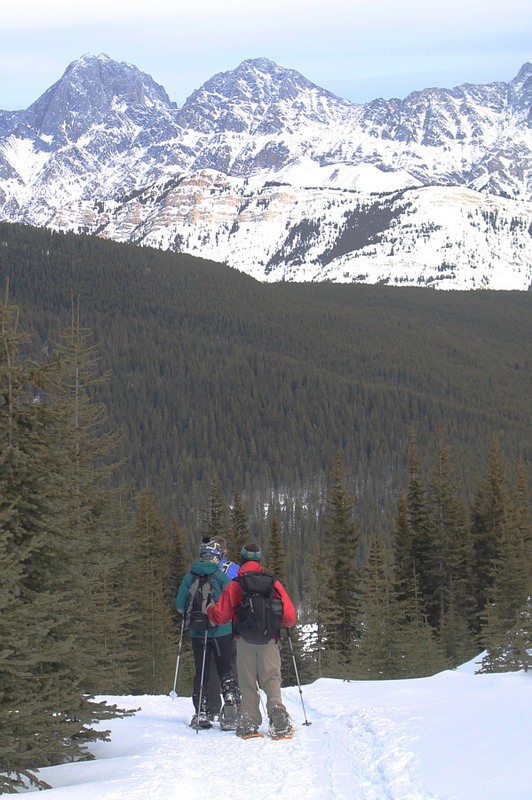 Near the high point of the ridge, the views begin to open up. Verena and Andy descend from the high point of the ridge while Mitch hangs back to take a photograph of them. Verena climbs up the penultimate knob along the ridge. 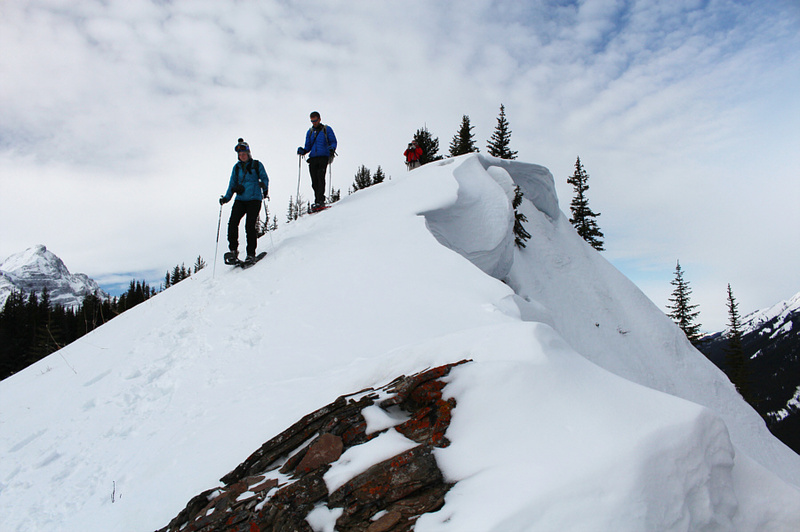 Sonny, Verena, Mitch and Andy stand on the eastern high point of Gypsum Ridge. 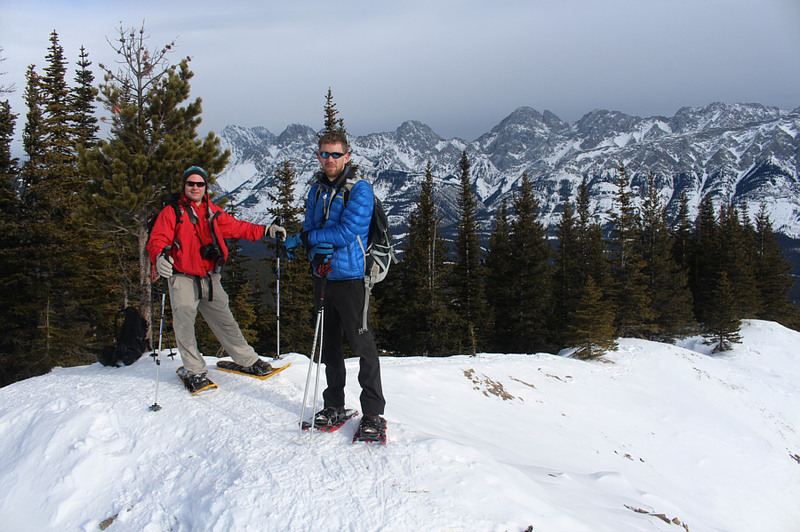 The Opal Range can be seen to the east behind Mitch and Andy. 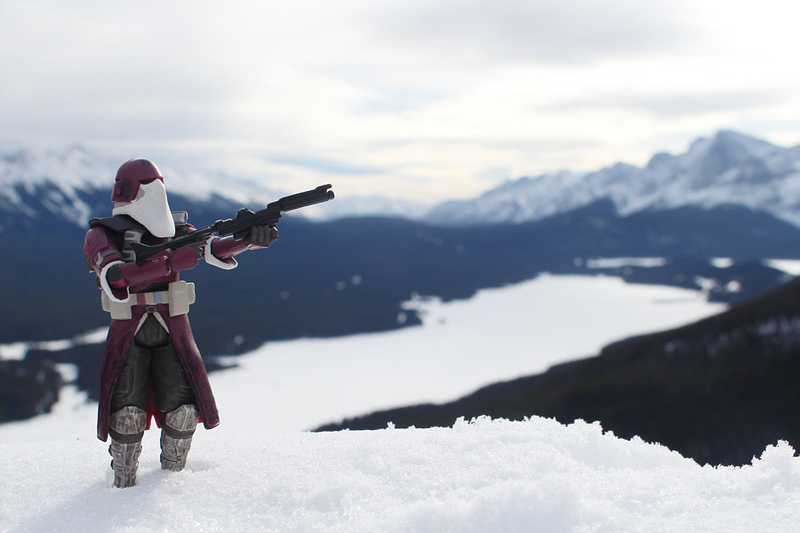 Here is a closer look at Mount Blane and the Blade. 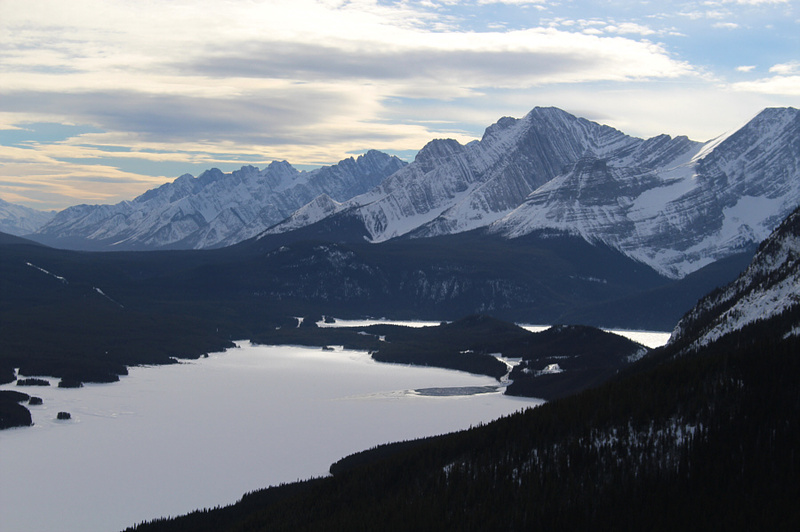 Lower Kananaskis Lake garners the most attention to the south. 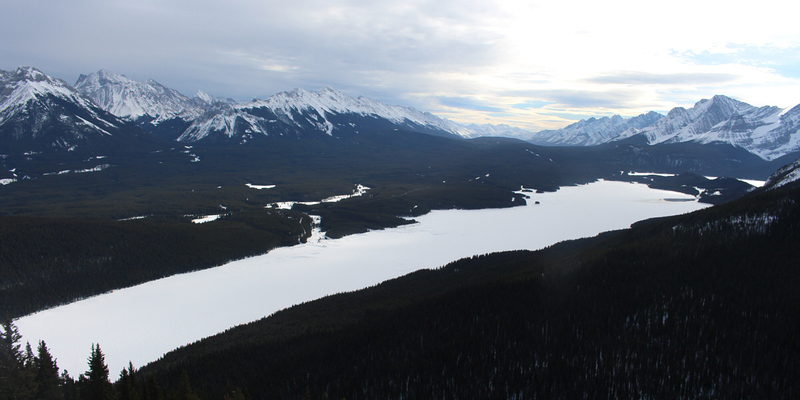 Parts of Upper Kananaskis Lake can be seen beyond Lower Kananaskis Lake. 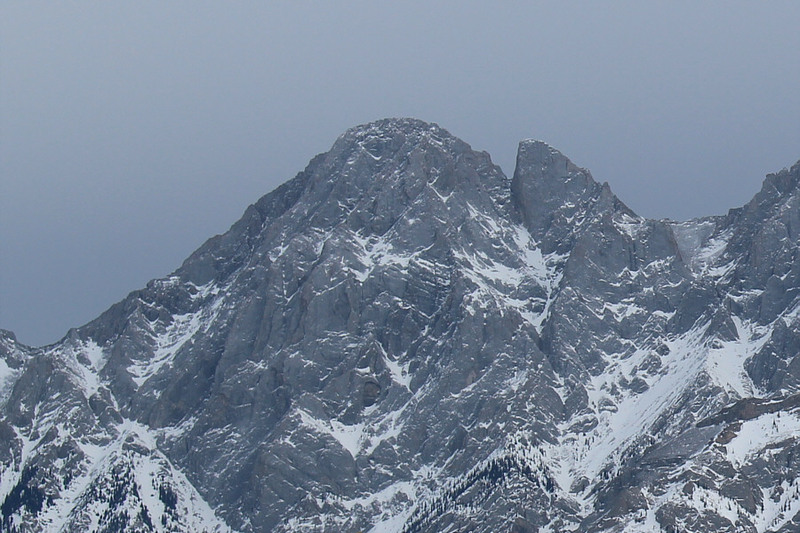 Mount Fox is the most prominent peak at right. Mount Invincible sits to the southwest. Mount Warspite remains the most striking peak to the west. 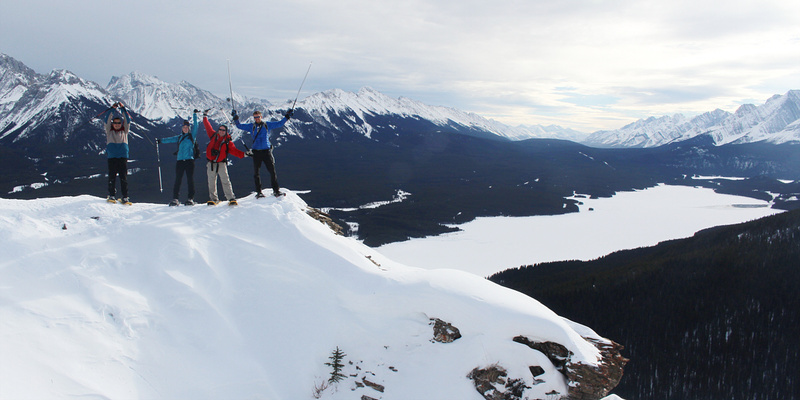 The group returns to the high point of Gypsum Ridge (2111 metres). 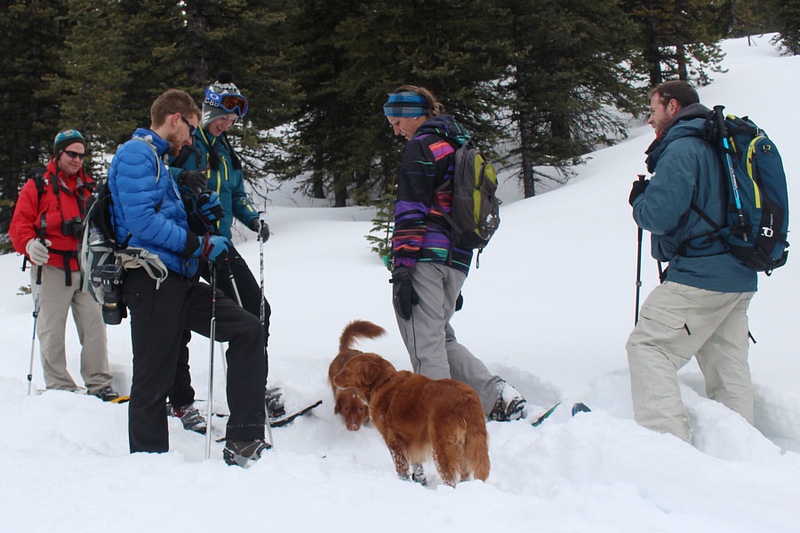 The group runs into a snowshoeing couple with two adorable dogs. Mount Packenham and Mount Hood dominate the distant skyline as the group marches down the road. 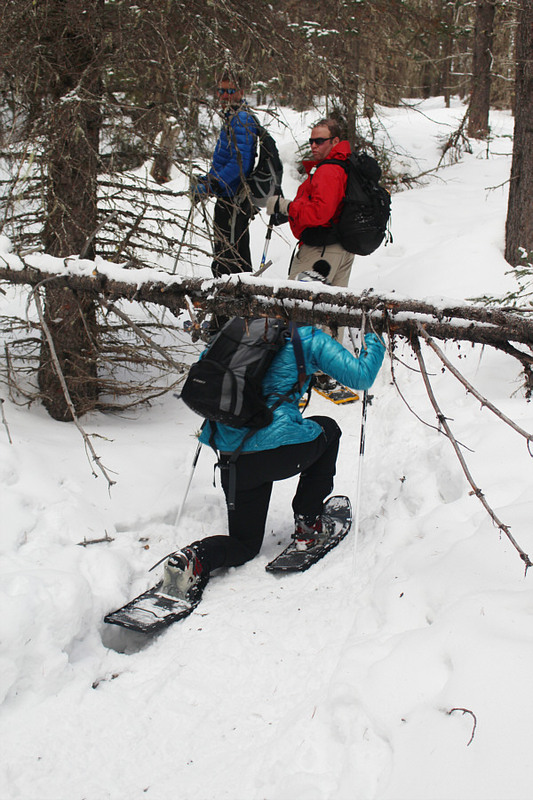 Verena crawls under some deadfall not far from the trailhead. 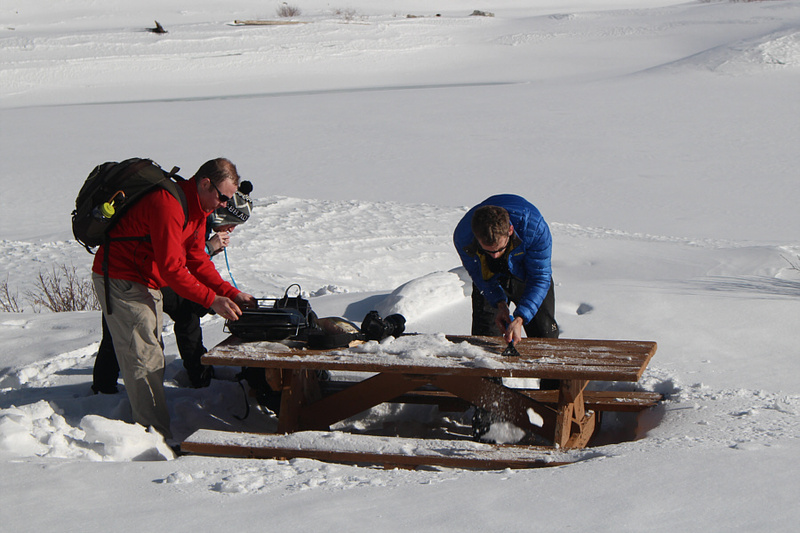 At Peninsula day use area, Mitch sets up his portable grill while Andy uses an ice scraper to clear the picnic table of crusty snow. Peninsula day use area is a wonderful place for a picnic on this day. 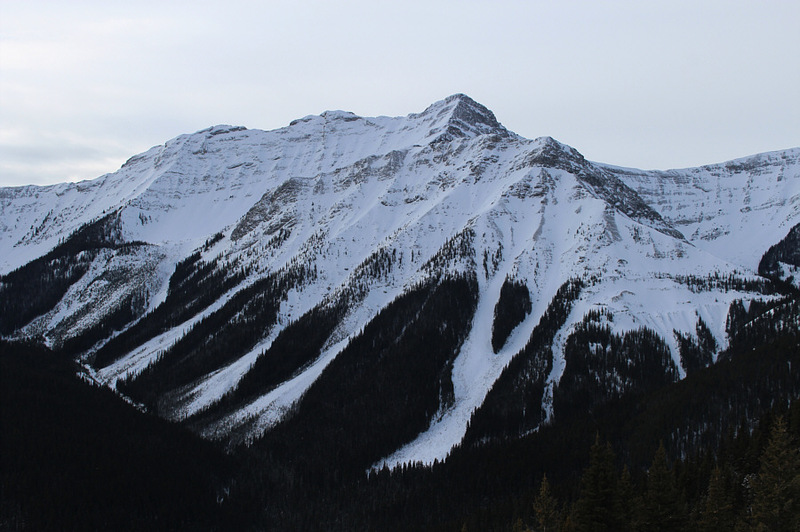 Mount Blane and the Blade are visible at left while Mount Wintour fills much of the view to the east. Mitch and Verena are all smiles in the sunshine. 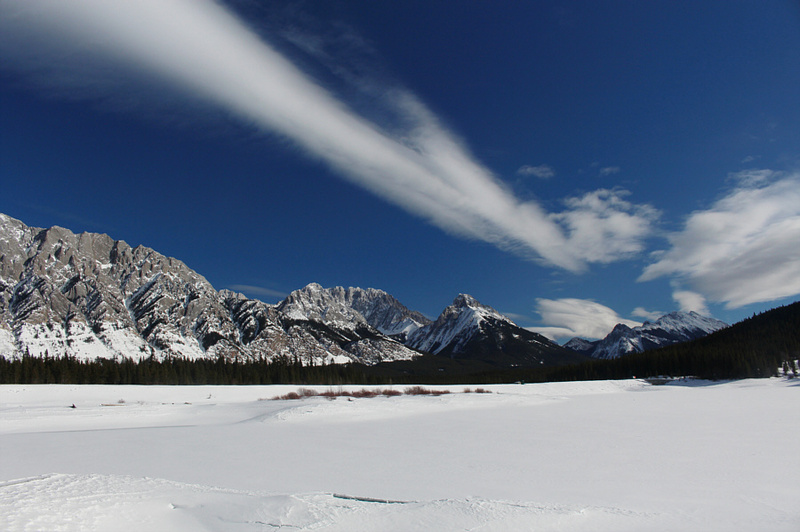 A Chinook-like arch stretches across the sky over Lower Kananaskis Lake. Mitch is the MasterChef of Spolumbo's sausages!